Today, co-owner, Amy McHugh and teammate, Kayla, spent their second day at Travel Impressions Best of the Best awards enjoying the property of Secrets Playa Mujeres. We started off the morning by grabbing an early breakfast at the Market Place Cafe. This is a buffet style restaurant and offered many different breakfast items such as eggs, bacon, French toast, pancakes, hash browns, fresh fruit, pastries, and more. The food was good and the variety of selections was nice for picky eaters. After breakfast we went to the ballroom for the General Session. The meeting was very informative and key note speaker, Linda Kaplan Thaler, was very inspiring & motivating. We then went to the trade show to learn more about our partner resorts and companies. After the trade show, we headed to the pool. They do have drink service around the pool area but not food service. Shout out to Polo, who provided excellent service at the pool. He was very attentive and knew us by name, which was awesome! Every so often, a man would come through with a cart that usually had fruit kabobs. That was a nice touch and good thing to snack on while lying around the pool. We also spent some time at the beach in the afternoon. The sand is nice and soft & the beach is a nice length so you can go for a walk if you want. Once the sun went down, it was time to head over to the new Dreams Playa Mujeres property. The resort is only a short walk from Secrets but since there is still a bit of construction going on, we were taken over by bus. As soon as we walked up the stairs, we could tell the property was going to be beautiful. The staff were all lined up greeting us and had big smiles on their faces, ready to welcome us to their new resort. Dreams is opening on November 30th. It is an all-inclusive, family resort with a water park, lazy river, pools, and much more to entertain both children and adults. We also went in and viewed a pool view junior suite. The room was very spacious, comes with either a King or two double beds, and tablet service. This is a unique feature of AMresorts. All rooms have an electronic tablet in the room that you can use to order room service, schedule spa treatments, and much more. 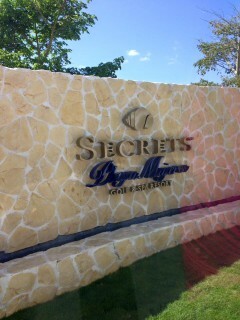 We're very excited to start sending clients to Dreams Playa Mujeres. It will be a great resort with something to do for all ages. There was live music and dancing at the dinner & everyone was entertained and enjoying the resort. We took a golf cart back to Secrets Playa Mujeres and went to eat at the Mexican restaurant, El Patio. They serve traditional Mexican food and everything was good. We also went to the Coco Cafe to get a sweet treat. The Coco cafe also offers different coffee drinks. The chocolate cake we had was worth every calorie. To end the night, we sat and had a drink in the Piano Bar. The atmosphere was very relaxed and was a good place to chit chat with others. After a long day of fun and activity, it was time to get some sleep. Tomorrow night is the awards gala. As always, please contact your Dream Agent today!